We recently came across a really awesome project using the LEGO MINDSTORMS NXT and the Raspberry Pi: The PiBot Raspberry Pi NXT Robot. Flypig.co.uk has released pictures, some code, and a quick explanation of how they combined the Raspberry Pi and the NXT. The Raspberry Pi is a credit card sized computer sold for about $25. It’s an amazing little board that runs a Linux-based operating system on an ARM chip. 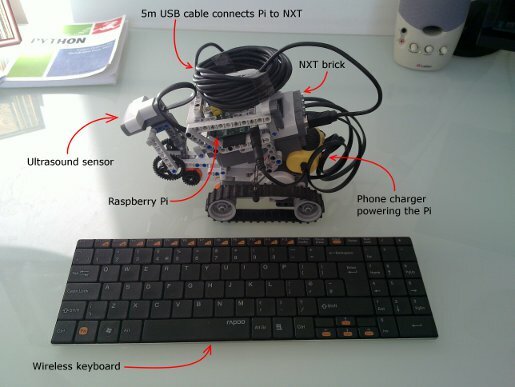 Using nxt-python, the project allows you to control the LEGO MINDSTORMS robot with a wireless keyboard, read data from the sensors, and drive entirely autonomously around a room. The wonderful thing about all of this is that although it requires a huge amount of effort and insight to get each of the individual pieces working, none of the effort was mine. Pulling the pieces together is really straightforward, building on so much clever work by so many people. It’s got to the stage where you can grab a phone charger, some Lego, a £35 PC the size of a credit card, a wireless keyboard, an entirely open source software stack, 5m of USB cable and a Sunday afternoon and end up with a complete robot you can program directly in Python. Brilliant.